Educating our customers on what’s available to them is important to us. The more our customers know the better they can tell us what they need. Generally, roof systems are separated into two (2) categories, Low Slope and Steep Slope. Low Slope systems are exactly as they sound, systems installed on a low slope (slope of 2/12 or less). Frequently, these are called flat roofs. Flat roofs have properties that are drastically different than those of Steep Slope Systems and because of this require special attention to detail when selecting the roof system material. Single Ply’s: EPDM (Ethylene Propylene Diene Monomer): EPDM is a synthetic rubber, single ply membrane. It has been commercially available and installed for over forty (40) years. Benefits include low installed weight, durability, long in-service life, reparability and ability to be installed on a wide variety of structures. Thermoplastic Polyolefin (TPO): TPO is another flexible single ply membrane. It differs from EPDM in that it is typically white in color and its seams are “heat welded” together. 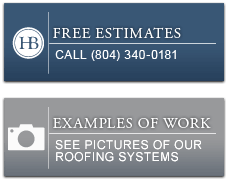 TPO roofing is relatively new in the marketplace. Benefits include low installed weight, lower cost installation and heat reflectivety. Poly Vinyl Chloride (PVC): Single ply PVC membrane is similar in appearance to TPO. The principle difference is its chemical formulation and its longer presence in the marketplace. PVC requires a slightly larger investment than TPO, it maintains all the other benefits. Ketone Ethylene Ester (KEE): KEE single ply membranes are drastically different in chemical composition than either TPO or PVC. It has a similar appearance to both TPO and PVC. Benefits include high chemical resistance, low installed weight, durability and long in-service life. Built-Up Roofing (BUR): Built-Up Roofing is generally characterized as the successive installation of layers (plies) of roofing material. BUR Systems can and were installed with either Coal Tar Pitch or Hot Asphalt. While Coal Tar Pitch roofs were installed up until the early part of the decade, they were found to be a known carcinogen and its production has now all but ceased. The more current and common installation of these systems is hot asphalt. While BUR roofs are generally more expensive to install, they have a long in-service life and are very durable. Modified Bitumen: Modified Bitumen roof systems are similar to BUR’s in the redundant application of plies. The difference is the plies are generally fewer and thicker. Modified Bitumen Roofs may be installed in a Cold Process Adhesive, Torched Down or with Hot Asphalt. The top ply sheet may be left smooth or may have a granular weathering surface. Less expensive than BUR Roofs, Modified Bitumen Roofs maintain the same durability.